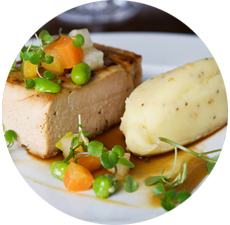 Set Lunch Menu now serving Monday - Saturday �15.95 for 2 Courses, �19.95 for 3 Courses. 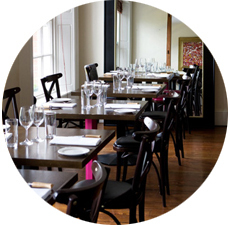 Early Evening Menu now serving Monday - Saturday (5.30pm-6.30pm) �17.95 for 2 Courses, �21.95 for 3 Courses. We offer our full a la carte menu for both Lunch & Dinner. Our aim is to provide a great quality dining experience in relaxed, informal surroundings with an emphasis on good value for money. The people responsible are: • Ms. Andrea Hussey (Front of House), formerly Restaurant Manager of L'Ecrivain Restaurant • Mr. Stephen McAllister, (Head Chef) formerly of One Pico, RTE's The Restaurant Show, The Afternoon Show. We have 2 beautiful rooms, overlooking Trinity playing grounds, which can both be booked exclusively for parties or corporate dining for groups of 30-40 on our first floor or 50 in our Mirror Room. We have some great news!! Our fabulous second floor has been tuned into a cafe. 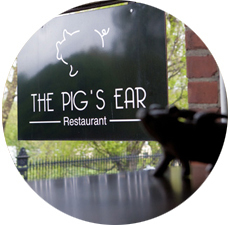 Monday - Saturday 9am until 5pm you can tuck in to some tasty treats at The Pig's Ear Cafe! !